Tuesday 9:00 – 9:45 a.m.
Moms attend this class with their child who will meet new friends and enjoy group participation. 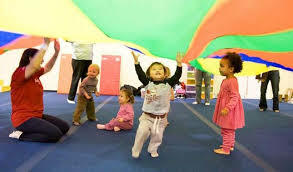 We offer parachute play, co-operative games, a mini-gym, songs, balls, and a fun time for the two of you. For children to get the most out of the class, it is preferable for the participants to arrive on time. This is a fast-paced class and you wouldn’t want to miss out on some of the fun! Please Note: There is no class on May 21. This is an 8-week course. Register for Mom & Tots Gym.